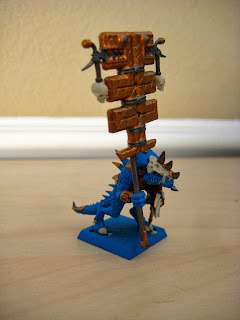 So I've still been working on my Lizardmen after getting done with Feast of Blades. I knocked out my Bastilladon. I think he came out pretty well. This whole army could use hilghlighting but this is pretty good for now. I'll need to get back to doing some more work on the base too. I also got the Terradons done as well. I just need to figure out what I want to do with the bases. They don't sit on these very well. So I could just glue them to these, or I maybe try something else. I'll probably just glue these and see how well they hold up I suppose. I haven't dipped these yet but I'm working on getting up to 1500 and 1750 now. So I needed some more Saurus. 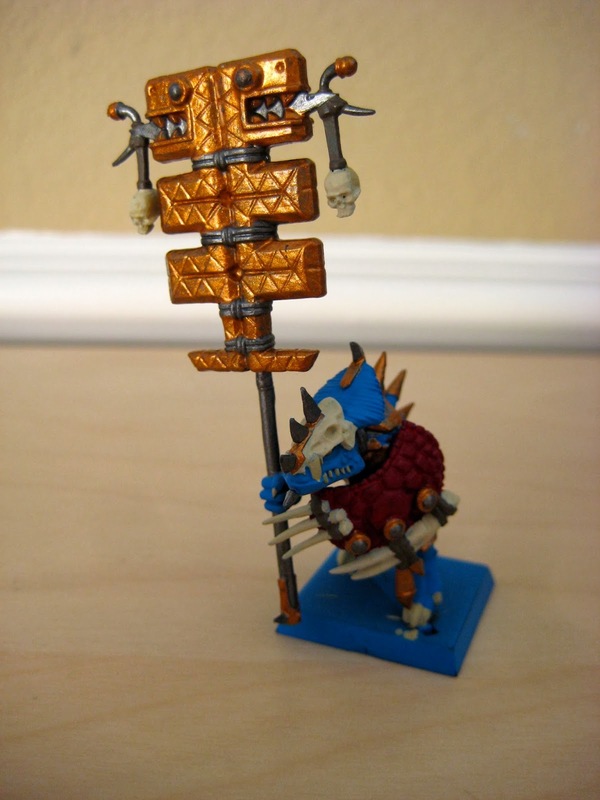 And I painted up my Temple Garud Banner bearer who I think I will use as a BSB Scar Vet for some of these game. I just can't see adding a Slann in until about 2000 points. I mean I think he can work... but with what I have I think I'm going to wait until 2k. At least that's what I'm thinking now... that might change with the next few games. Speaking of I did get one more Fantasy game for 1250 against HE. I thought I was doing ok but was anybodies game, until he failed a few key LD. I think we've seen more critical LD issues in these lower point Fantasy games than expected. So that's why I'm thinking of getting that BSB in there to make sure my block sticks around as long as possible! So Fantasy has been fun, and the bikes are pretty much ready to roll for any 40k tournament (minus a few Grav Guns to paint I think). Plus my Tau are still quite good and I'm happy to play that anytime. But I do still want to make some of the other armies work. BA are in pretty rough spot. Orks too though I think they can still be fun. My Templar and BT are both ok but it is almost like they have the wrong bits for their new dex. Then there is my 1ksons which are really still just frustrating. They look great, and they can win some games... but they are so hard to play in all comer type events. So right now I'm looking at my Drop pods and thinking about what to do. I might spend some time and money to try to make something work there. Though lord knows I could also use that time and money to get caught up on video games that I've not gotten around to playing. So ya... that's where we I am right now with the hobby! Can You Own Too Many Marines?